You’ve got a company anniversary and wonder how to surprise your boss with something unique and personalized? We’ve got exactly what you need! 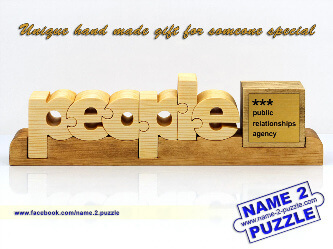 A personalized company name puzzle gift will be kept and placed at a noticeable place in the office! 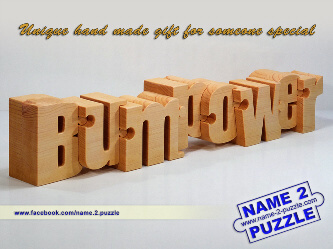 Do you want to surprise your partners by making them a delightful present advertising your company? 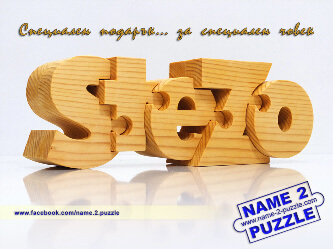 Every corporate name puzzle is meticulously cut from a single block of pine wood. The characters are designed to interlock with each other in a way that creates a sense of harmony and integrity. Each piece has its own unique characteristic. We’ll do our best to make a design as close as possible to your logo or brand name. Add a personalized touch of class to your corporate name puzzle by including what type of company it is or years of anniversary on a laser engraved metal band. 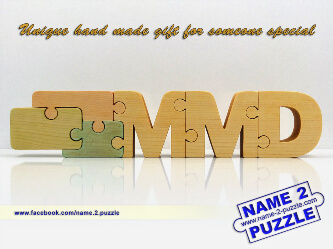 The company name puzzles are beautifully handmade, sanded and finished with olive oil to produce a lasting and rich finish. This is a gift that will be treasured forever! NOTE: We do not have ready to buy company name puzzles. We make them only by order. Dimensions: 29 x 8.5 x 4 cm. Dimensions: 30 x 6.5 x 4 cm. Dimensions: 22 x 7 x 4 cm. Dimensions: 35 x 7 x 4 cm.